Posted on March 9, 2018 at 5:59 am. The WMS field trip to the National Museum of African American History and Culture is scheduled for TODAY. Participants should report to the cafeteria at 9 a.m. this morning to prepare for the trip into DC. And remember to bring 20-dollars for lunch! See Ms. Cameron or Ms. Mays with any questions. And now for an important Technology Tip from Ms. Solomon: If your iPad is “locked out” this morning, you MUST bring it to Ms. Solomon’s office TODAY to be UNLOCKED and UPGRADED. We’re preparing our technology for the SOLs — which begin NEXT WEEK for 8th graders — so you can’t put it off even one more minute. Also, remember to fully charge your iPad EVERY NIGHT so that it’s at full power for the test, and your classes. Who wants PIZZA? The WMS Model UN Club will be hosting a pizza fundraiser TODAY after school in the Main Lobby and by the Cafeteria. It’s just 2-dollars for a slice and cookie! All proceeds will go to support upcoming MUNer competitions. Come hungry!! All middle school boys are invited to the upcoming APS “Color of Leadership Conference — Find Your Superpower!” — TOMORROW from 8am to 2:30pm at the Arlington Career Center. This exclusive program includes leadership workshops, roundtable discussions, mentoring, and of course FREE FOOD!! Interested boys MUST register for the event TODAY. To sign-up or for more information, see Ms. Cameron or go to the main office. Boys rule!! The Boys Cohort will be meeting on MONDAY during ASP 1 in room 233. It’s an opportunity for Black and Latino students — and their allies — to meet new people, and become LEADERS in our community. There will be a special guest speaker at the meeting next week, so don’t be late! See Mr. Hicks, Mr. Eason or Mr. Valdez with any questions. The March Madness Tournament of Books is underway! Today is your last chance to vote for the Sweet-16. Just make your picks using the QR code by the cafeteria, or follow the link in today’s Morning Announcements Blog. There’s a lot of great books out there, but only ONE can be the CHAMPION!! And now it’s time for our weekly segment: Champions of Change! Honoring the innovative, courageous, and dedicated Americans who helped to shape the world we live in. 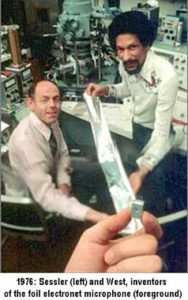 Meet James E. West — a physicist from Farmville, Virginia — who liked to fiddle with electronics. In the 1960s, West helped to develop an inexpensive, compact, highly sensitive microphone. This groundbreaking technology ushered in a new era of audio innovation. 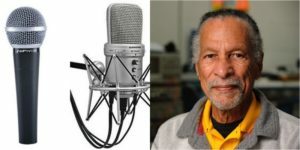 West’s microphone is now used in over 90-percent of all microphones in the WORLD, including cell phones, laptops, baby monitors, and hearing aids. 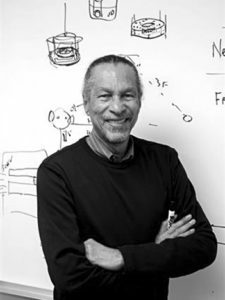 West went on to patent over 200 additional inventions, became a professor at the prestigious Johns Hopkins University, and was inducted into the National Inventors Hall of Fame in 1999. His efforts truly make him a Champion of Change!